Listen live to BBC local radio in Bristol, Gloucestershire, Somerset and Wiltshire. That's all for now from an extended BBC Local Live for today. Our big story has been the accident on the M5 between two lorries which led to some 16 hours of traffic chaos and 21 mile queues. It's all but cleared now but the affected section near Weston-super-Mare will be closed at midnight for emergency repairs. We've also heard a woman from the Chard area is critically ill after being discovered near a reservoir. And a man has been detained after a potential chemical incident in Bristol. A female dog walker has suffered a potentially life threatening head injury. The woman was with her dog at about 4pm, near the reservoir close to Chaffcombe Road, Chard, when other dog walkers heard a scream and found her. She was taken to Musgrove Park Hospital in Taunton before being transferred to Southmead Hospital in Bristol for specialist treatment. She remains in a critical condition. Residents from five blocks of flats are in a rest centre in Bristol after an incident near the ss Great Britain. They were evacuated earlier this evening. A man has been detained by police. Police say one man has been detained in connection with a suspected chemical incident in Bristol. Five blocks of flats have been evacuated and bomb disposal teams are on the scene. Bristol City Council says residents from five blocks of flats have been asked to leave their homes as part of an on-going chemical incident. They are Kingdom House, Steamship House, Great Western House, Great Eastern House and Horsley House. A nearby rest centre has been set up in the nearby Spike Island building on Cumberland Road. Residents told the Bristol Post homes were evacuated at about 20:00 BST due to a "threat" to one of the buildings. A bomb disposal team has arrived at at Gas Ferry Road in Bristol as part of an ongoing "chemical incident"
Nearby residents have been asked to leave their homes and go to a rest centre at nearby Spike Island. That's all from BBC Local Live for the West of England. We're back from 7am on Monday with all the latest news, sport, travel and weather. If you're still stuck northbound on the M5 we're told it shouldn't be too long before you start moving again. Earlier all three lanes were opened to let the then 21 miles of queued traffic through - but that took sometime to ripple southward. The M5 will be closed again - around midnight - to allow emergency repairs - once the backlog has cleared. The M5 has been reopened to allow miles of traffic to clear - but will close again to allow resurfacing work at midnight. The works needs to be done after a diesel spill following an accident involving two lorries earlier today. Dave Sledge from Highways England explains why the work is necessary. A "small number" of properties around the ss Great Britain, in Bristol, have been evacuated following a possible chemical incident. A cordon has been put in place after the "discovery of items" in one of the flats, police said. 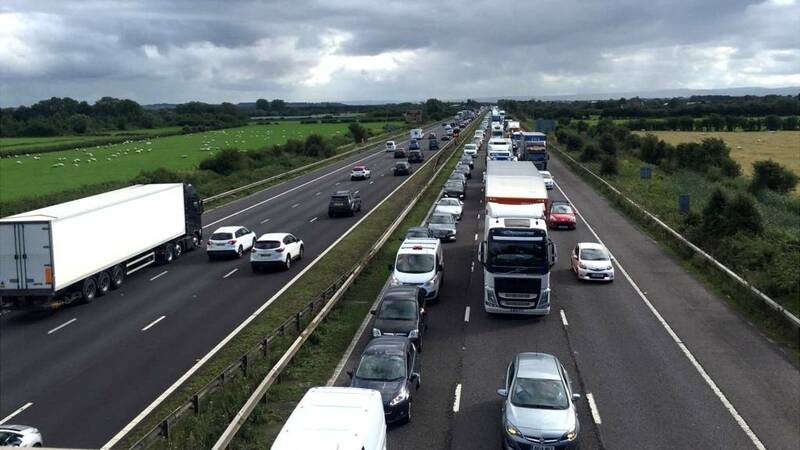 These pictures were taken a few moments and show the traffic is still busy northbound on the M5 particularly around Highbridge and Burnham-on-Sea. But the good news is that the traffic is starting to move once you pass Weston-super-Mare and Clevedon. Highways England says all three lanes are now open around the accident site to clear some 21 miles of tailbacks. But a spokesman added that after midnight the three lanes will be closed again to allow emergency roadworks to continue - although the hard shoulder will remain open. Bournemouth forward Sam Surridge has joined League Two side Yeovil Town on a season-long loan deal. The 19-year-old, who has yet to make a competitive first-team appearance for the Premier League club, scored eight goals on loan at Poole last season. The fire service is speaking to concerned locals in Bristol tonight about the steps being taken to safeguard high-rise buildings. A public meeting's being attended by Avon Fire and Rescue Service, and Bristol City Council representatives, following the tragedy at Grenfell Tower in London. The Highways Agency says there are tailbacks of up to 21 miles on the M5. Drivers travelling long distances northbound on the M5 are advised to consider delaying the start to their journeys because of major traffic problems. They're reopening the motorway to allow this to clear, before closing it again to start resurfacing work at midnight. Cheltenham Town fan Daniel Hopkins is the very proud owner of his team's stadium in miniature. He won a competition to have Whaddon Road built out of LEGO. It's been made by Jules Richards who has previously created numerous other football grounds, including Watford’s Vicarage Road, Sheffield Wednesday’s Hillsborough and Charlton Athletic's The Valley. Daniel said he was "excited" to have won the model. Highways England says all three lanes of the M5 will be reopened from 7.30pm to allow 21 miles of traffic queues to clear. There will be a 30 mph speed limit. The motorway will be closed again from midnight to allow urgent resurfacing work to take place. However, the hard shoulder will remain open. All three lanes of the M5 northbound between junction 21 and 20 should be open again from 7.30 this evening, according to Highways England. There will be a reduced speed limit - it's hope this will ease queuing traffic. There have been "unprecedented delays" on the motorway and surrounding roads today after an accident involving two lorries led to a diesel spillage. It means the carriageway needs resurfacing. To help drivers complete their journeys as quickly and safely as possible our teams have focussed on temporarily reopening all lanes. The slip road to join the M5 at junction 21 will also be opened. Once the traffic is eased we will complete the necessary resurfacing. Drivers are asked to help us by adhering to the reduced speed limit. First Bus says it is facing "unprecedented delays" to its North Somerset services in the aftermath of the earlier accident on the M5. It says the X1, X2, X3, X4, X5, X6, X7, X8 and X9 services are experiencing severe delays as motorists seek to avoid long queues on the motorway. "Drivers that have been working in the area for over 40 years are saying that this is the worst traffic they have ever experienced," a company spokesman said. A Bristol Water engineer has found a small alligator on the shores of Chew Valley Lake. A spokesman could not confirm the species, but said a staff member "bumped into it" doing a routine survey. It was captured by two Bristol Water staff who put it in a container ready to be collected by the RSPCA. Video caption: Watch: Bristol Water engineer spotted an alligator roaming around the Chew Valley Lake site.Watch: Bristol Water engineer spotted an alligator roaming around the Chew Valley Lake site. Drivers caught in the jams on and around the M5 between Bristol and Weston-super-Mare say they've been delayed for up to six hours. Highways England says all three lanes and the hard shoulder need resurfacing after the earlier accident and diesel spill.